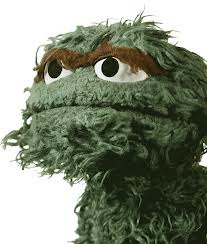 How do you react to a grouch? Thanks Tom. Hmmm, The best part was when Spell Checker didn’t red flag “curmudgeonly” after I typed it! I wonder if Bill O’Reilly has ever featured the word “curmudgeon” as a Word of the Day? I agree. Good word. Very good post, Karen. Some days seem to be filled with Oscars, don’t they? I am posting to my website today, talking about being “out of kilter” a term my grandma used to use. Don’t you just love the richness of words? I know that “out of kilter” phrase! Wonder how it originated! Thanks for your kind comments. Love the trash-lined life comment, Karen. So true. Indeed, without God’s grace we’d all be in the dumps. Thanks for the reminder to share/show it. Love, love, love it! And yes, when I’m the grouchiest is when I need love most. Now if I could just remember that for others! Well done! Excellent reminder, Karen. Who doesn’t want to be loved unconditionally? I can think of no greater way to show God’s love than to do just that, especially when it’s hard and undeserved. I have an older friend who says there are 2 ways to change a block of ice. You can either take a hammer and smash it to pieces or warm it and let it melt. Our words have the same effect on people, especially the difficult ones. We can try to shape them up with sharp words, or soften their gouchiness with loving words, in hopes of melting their hearts. We all prefer the latter. Thanks Linda. Now, the trick is to remember this when the grouch is aiming the contents of his/her trash can at each of us! Oh Karen, this is so me. I hardly ever have grace to those who deserve it (driving, forget it), but yet I expect it from others when I make mistakes. Talk about hypocritical! On those days when I’m feeling charitable towards the human race, it doesn’t take long before my patience runs out when face with the grouches. I believe you’ve hit a very relatable and almost uncomfortable point at how much we don’t deserve God’s love. But isn’t it great how gracious He is! Thanks Davelyn, Karla, J’nell and Linda. It’s gratifying to hear I am not the only one who struggles with patience with grouchy people. I’m committed to keep trying and pray God who help me to keep improving at this thing called unconditional love.